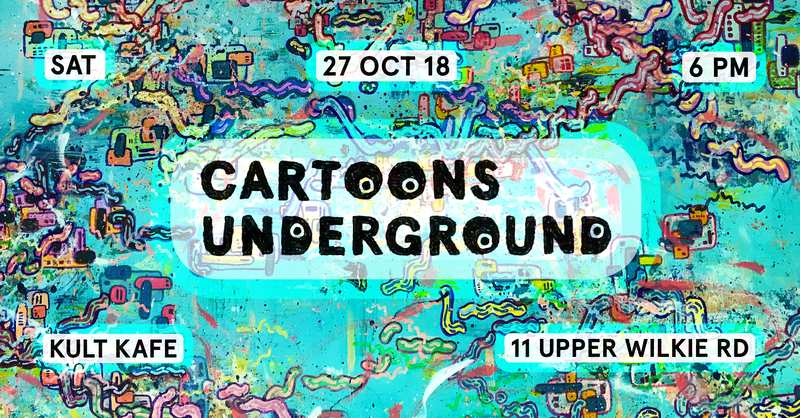 Southeast Asia’s first and largest underground animation festival is back! We are back! Cartoons Underground (www.cartoonsunderground.com) celebrates more than half a decade of independent, underground, adult-friendly animation for you adult-kids! Get ready for heart palpitating scenes, and plots that will drive you to the edge of the seat! In our 7th year, we received over 1,500 entries from 90 different countries, and curated three amazing programs featuring 21 award-winning animated films, some of which will be making their debut in Asia, and have came from international festivals including Ottawa, Zagreb Animafest, Bucheon and more! Visit our unique artist market and discover hidden gems, and Kult Gallery’sThe Super Sucklord exhibition, while enjoying and trying out trippy animation that will be projected on Kult Kafe’s iconic colonial building by Mi5chief Makers! Grab a beer and a fistful of popcorn and catch award-winning animated films while meeting the actual creators themselves! Enjoy the first ever ‘Best Singapore Student Animation’ program, and two international programs titled ‘Different Worlds’ and ‘A Word Please’. Admission is by donation, so if you enjoy the films please help contribute to ensure the future of our artists and the festival! 10PM – Award Ceremony of the official Golden Durian Awards!